Cushions are like handbags right? You can never have too many of them! Well that’s what I tell myself and my husband when another cushion parcel lands through the door. I’ve often written about gorgeous cushions for the home, and this time it’s about cushions and throws by isme.com Delivered in a very large, very heavy box, it was the throw of course that added to the weight. Our house is draughty and cold in Winter, particularly the living room and I think no matter what you do to a Victorian house this problem is always going to rear its head. We’ve insulated under the floor, added another radiator and have lined curtains at the window but it still gets chilly in there. My solution? Add another throw into the mix. Isme.com sent me the most beautiful soft sheen Levenzo throw in Chocolate. You can see the sheen in the image above. It really is lovely. Soft, warm and very heavy with a cotton backing and lining. It retails at around £40 and is quite large at 150cms by 190cms. It’s textured fur finish and supremely soft feel means it has been very popular in our house since it arrived. I can see this one being taken up to the bedroom too and thrown over the bed for the really cold nights. 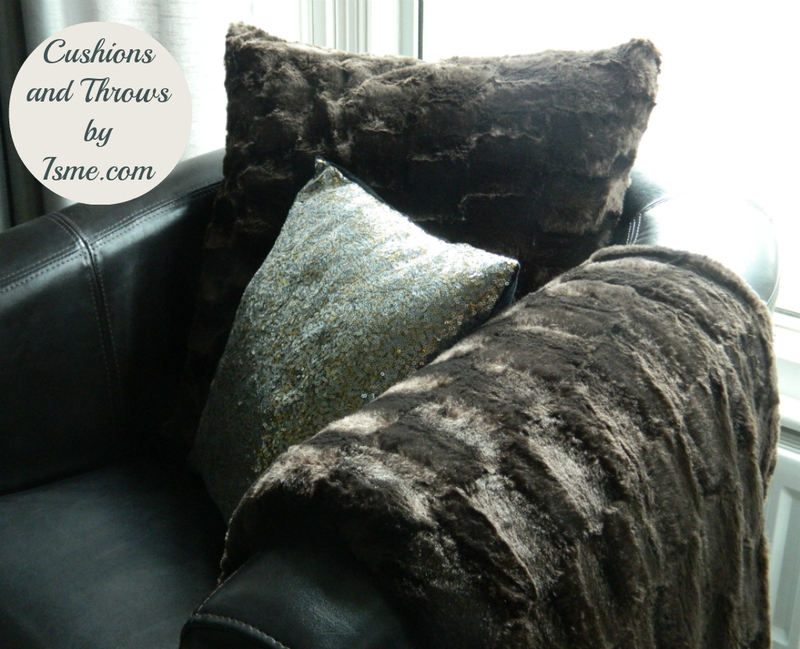 The two large Chocolate Levenzo cushions that came along with the throw (the silver cushion above is my own and just for the purposes of showcasing the Isme items) are equally as soft and furry. Plump, firm and seemingly well made, these items are a big hit in our home. Asy ou can tell from the image they’ve blended really well into our living room and I’ve mixed up the textures by putting them with some little silver sparkly cushions that I already had.I think the different sizes and textures breaks up the expanse of fur and adds something a little different. So come on Winter, I’m all ready for you this year! How about you? Are you a fan of a throw or blanket in the living room for the colder evenings?